Civilization, the board game, is a game with a lot of interaction between the players and very little chances of being eliminated during the game. The object of the board game Civilization is to be the most balanced in areas such as cultural, economic, and political. The game winner of Civilization needs to maintain the best balance between the nomads, farmers, citizens, merchants, and adventurers. Civilization starts at the Dawn of History and works through the years to the time of civilization between 8000 B.C. and 250 B.C. Civilization is not a war game, however some conflicts may be fought throughout the course of the game because of land shortage and rivalry. 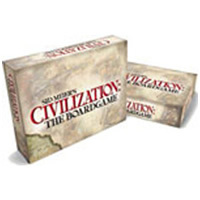 Play this Civilization board game today! There are actually four different ways you can win Civilization: a culture victory, a tech victory, an economic victory and a military victory. See game rules for more details. You should have a market board, 6 civilization sheets, 6 trade dials, 6 economy dials, 6 plastic connectors, 6 home map tiles, 14 neutral map tiles, 12 city markers, 24 army figures, 8 scout figures, 1 Russian army figure, 55 square combat cards, 224 small cards, 12 wonder markers, 6 culture level markers, 18 great person markers, 28 military tech markers, 49 building markers, 20 hut markers, 10 village markers, 12 disaster markers, 1 first player marker, 16 market resource tokens, 90 culture tokens, 28 wound tokens, 75 coin tokens, 4 reference sheets and the official Civilization game rules and instructions. Please keep in mind that the official Civilization board game rules and instructions could be different depending on the game version you have. The rules below are some of the exact directions on how to play Civilization. Share with us your comments, funny stories, tips, advice, strategies, creative ways to play, questions about how to play, problems with the rules or anything you want about Civilization. All submissions will be reviewed within 24 hours. Click here to add your Civilization comments. This is a game for serious board gamers. You open the box and see all the contents and it looks more like a small figurine toy box. There are a lot of pieces and the rules are not the easiest to learn how to play. A very involved game. I watched a group play this and it looked very intense.